The top of each worksheet has a vowel strip with picture keywords showing the five short vowel sounds. ​Your student can refer to it to remember the vowel sounds when needed. ​What is a Short Vowel? All vowels have long sounds and short sounds. Emerging readers often get confused when presented with words that have different vowel sounds. This is why all the words in these sheets use ONLY short vowels. This makes it easy for a child to sound the words out, a skill essential for emergent readers. Students do NOT need to know long vowel sounds to use these worksheets. How do the levels progress in these workbooks? There are five sequenced workbooks, each consisting of 12 worksheets (except for the first workbook which has 13). Each workbook progresses to the next level with increasing difficulty, so only move the child up when ready. If more practice is required, have the student repeat a workbook or worksheet as needed before going up to the next level. 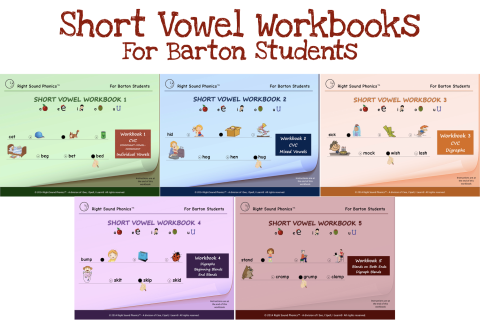 If you have purchased the digital workbook, you may take unlimited printouts of the worksheets. Why these specific words and pictures? The workbooks have been created after studying the patterns of errors children make while reading. There is a reason behind the combinations of words and pictures. Sometimes, the word choices in each row begin with the same letter sound. Sometimes the letters are reversed (lap, pal), and sometimes the word choices all rhyme (dad, had, sad). These force the child to read the entire word, and not just guess the answer, based on memory or the shape of the word. Who can use these workbooks? How to use these workbooks? The child simply fills in the bubble space next to the correct answer. The worksheets are classified by numbers on the top right corner of each page. So 1-8 means Workbook 1, Worksheet 8. An answer guide has been provided at the end of each workbook. If you have the printed version of the workbooks, have your student use a dry erase marker on the workbook, so you can reuse the worksheets. If you have purchased the digital version of the workbook (pdf), you may reprint worksheets as needed. Have the student record the answers in a separate notebook. Write the workbook and sheet number on the top of the page. Example: “Worksheet 1.3”. Write the numbers 1-8 down the page. The child writes a, b, or c next to each number. Take one color printout of each worksheet. Place each printout in a clear sheet protector (or laminate the worksheets) and give your student a dry erase marker to mark the answers on the sheet protector (be careful not to use Sharpies!). ​Erase the answers when done, and the sheet is ready for the next student or for the student to work on it again. 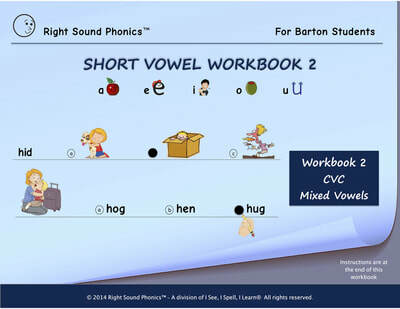 Phonics/​Short Vowel Workbooks for all learners in K-5, Click here. 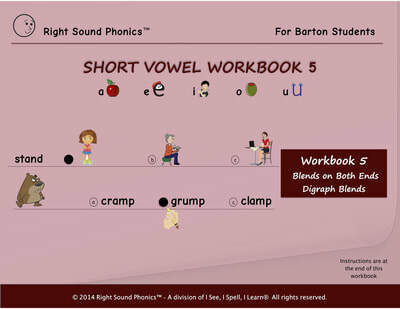 Roma Chadha, creator of Right Sound Phonics™ workbooks is a Certified Barton tutor. ​These workbooks were created with prior written permission of Susan Barton, developer of the Barton® Reading & Spelling System. Workbook 1 - Use in Barton Level 2 for the indicated lesson. 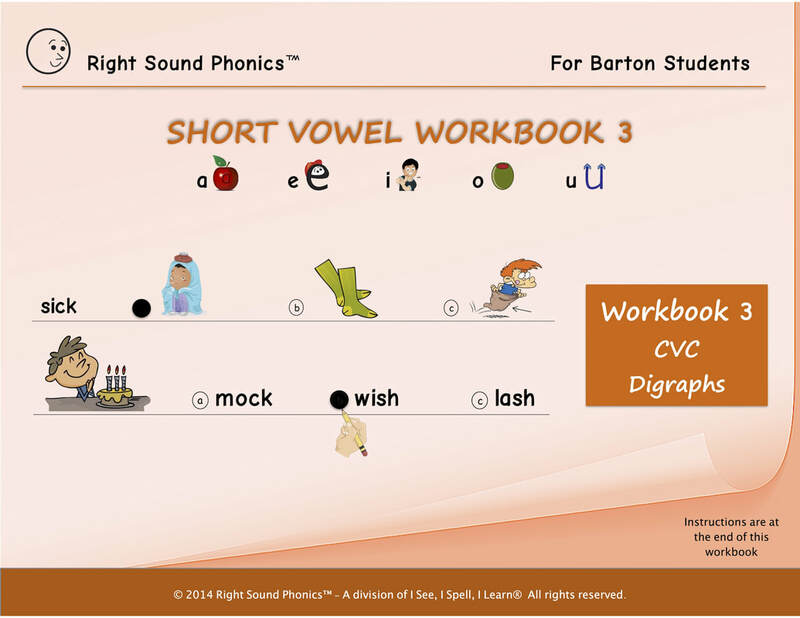 Workbook 2 - CVC words with all the 5 short vowels and all consonants. (Example: dog, cat, hit, beg). The first 4 worksheets have words with all 5 short vowels, digraphs, and end blends (blends at the end of the word). The last 8 worksheets have words with beginning blends. 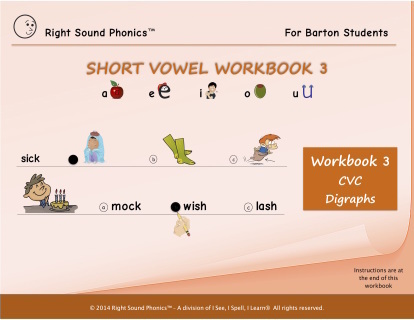 It is more difficult for children to read consonant blends at the beginning of a word, and that is why there are more worksheets provided to practice this skill. A child should not move on to Workbook 5 (Mixed Blends) until the words from Workbook 4 can be read fluently.